(Halifax, NS) – Tracing Tracks is a project by established media artists Edith Flückiger (Lucerne, Switzerland) and Germaine Koh (Vancouver) produced for the exhibition (im)mobile by the Centre for Art Tapes in Halifax, Canada and White Frame in Basel, Switzerland. The Centre for Art Tapes has partnered with Dalhousie Art Gallery for the first iteration of the (im)mobile exhibition, which opens Friday, October 17th, 2014 with a public reception at 6PM, followed by a guided tour connected to the Killam Lectures series at 8PM. The artists Flückiger and Koh will be in attendance on October 17th. The exhibition runs through to November 30th, 2014, and is curated by Mireille Bourgeois, independent curator (Halifax), and Chantal Molleur, curator and co-founder of White Frame (Basel, Switzerland). Tracing Tracks is an on-line game for experiencing different spaces. Topography, history, politics, and building conventions all shape the way we navigate our environments. This game challenges the orienteering skills of players, enabling them to feel the differences between various locales. 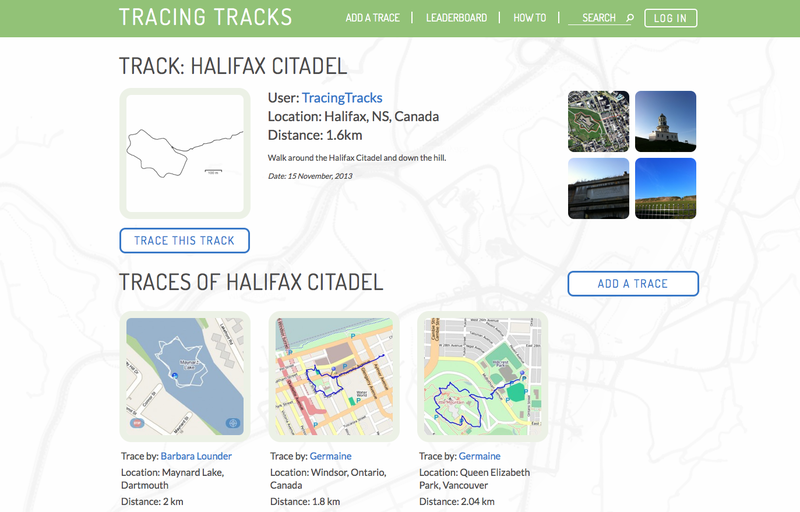 Users are asked to take an existing track recorded by another player and re-trace these steps in another site. This action highlights the diverse logics underlying space. Tracks can be downloaded either as line drawings to overlay a map or as coordinates for a GPS device. The game will live online during the course of the exhibition, which after its premiere in Halifax will travel to the Haus für Kunst Uri in Altdorf, Switzerland in 2016. This online project was made possible through the generous support of Arts Nova Scotia, and the Canada Council for the Arts. Edith Flückiger is a Swiss artist based in Lucerne, Switzerland. She works with media and text based art. She focuses on man’s fate and explores the fragility of our existence and tangible moments in life. Her works were curated in group and solo exhibitions in Europe and South America. She has been included in private and public Swiss collections, has won prizes and European residencies in Paris and Berlin. She is represented by the Swiss gallery Hilfiker Kunstprojekte. Germaine Koh is a Vancouver-based visual artist whose work is concerned with the significance of everyday actions, familiar objects, and common places. She shows her work internationally and across Canada. Formerly an Assistant Curator of Contemporary Art at the National Gallery of Canada, she is also an independent curator and partner in the independent record label Weewerk. Koh has received the Shadbolt Foundation VIVA award and been a finalist for the Sobey Art Award. Mireille Bourgeois has an MA from the Centre for Curatorial Studies at Bard College. She has curated throughout Canada, the US, and Germany, and has published artist books and monographs, as well as critical writing for Visual Arts News, Creative Times Press, C-Magazine, and the Canadian Film Institute. Bourgeois is the former Director at the Centre for Art Tapes in Halifax, Nova Scotia, and is currently an independent curator. Chantal Molleur is co-founder and curator of White Frame, a nonprofit association that operates at the intersection of video art, cinema and photography. She has an upcoming curatorial exhibition project with Swiss artist Max Philipp Schmid, and development collaborations with photographer Katrin Freisager and experimental filmmaker and photographer Ralph Kühne. She is the Swiss delegate for the International Festival of Films on Art of Montreal. The Centre for Art Tapes is a not for profit artist-run, charitable, organization that facilitates and supports artists at all levels working with electronic media including video, audio, and new media. We provide services to a diverse membership, and the general public, that include production facilities, ongoing exhibitions and screenings. As well we provide programs that offer, through training and in-house residencies, opportunities for individuals to critically engage with cultural and social issues. The Dalhousie Art Gallery is a public art gallery, an academic support unit within the educational and research context of Dalhousie University, and a cultural resource for the whole community. We offer a balanced program of travelling and in-house curated exhibitions of both contemporary and historical artworks, and a related program of artists presentations, lectures, panel discussions, films and videos, and other special events.